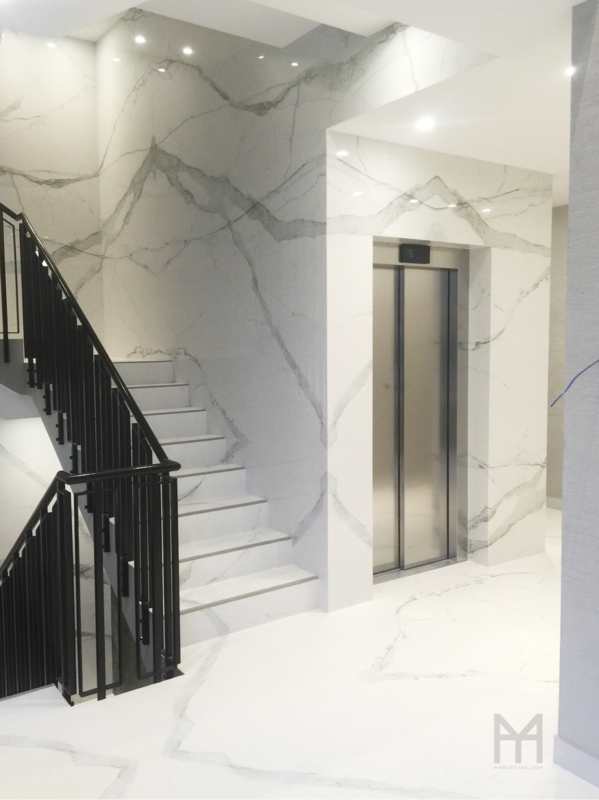 This stunning design, installed by Marc Hilligenn of Marc Tiling, features the beautiful and realistic Calacatta Marble effect tile with a book matched stone pattern printed across 20 thin porcelain tiles, each measuring 1200 x 600m and 4.8mm thick, to create one large, spectacular 4.8m x 3m image. Consulting on the project were Gary Walsh of GB Walsh Floor and Wall Tiling and the owner of Porcel-Thin® Ray Smith with adhesives supplied by Tilemaster Adhesives. Suitable for walls and floors the Book Match collection from Porcel-Thin® combines the beauty of natural stone with the inerrant strength and light weight quality of large format and ultra-thin porcelain tiles. 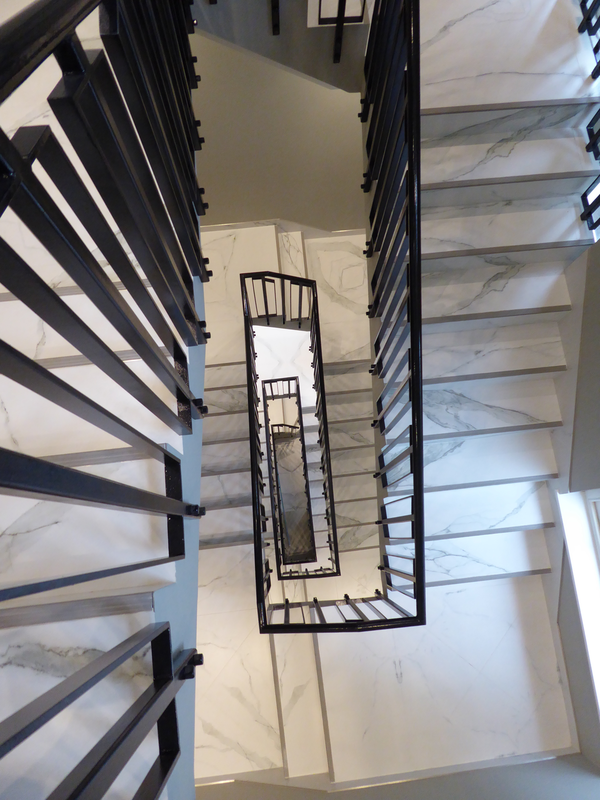 In this instance the Calacatta Book Match range was polished on the walls with a subtle matt finish for the floors. Schlüter-Systems has been the market leader in essential accessories for tile and stone since it was founded in 1966 and they provide complete system-solutions and technical support for residential and commercial tile and stone projects, large or small. The staircase of the apartment block was protected using Schlüter®-TREP stair nosing profiles for edge protection and safety. Steps are a feature of everyday life, yet making them safe, protected, and maintaining tiled staircases or turning them into a focal point, is a different matter altogether. The edges of stairs, are often exposed to heavy mechanical stresses and represent a high risk for injuries through slips and trips. The slip-resistant design and visual prominence of Schlüter®-TREP stair nosing profiles improves safety on staircases, maintaining and protecting installations to keep the edges of the tile or natural stone covering intact. Although it is often the best way, the inclusion of stair nosing profiles is not always a consideration during an initial design stage of a project; one benefit of some Schlüter®-TREP profiles, is that they can be retrofitted to enhance the safety of a stairway at a later date, where this is the case. Schlüter®-TREP profiles provide a multitude of design options to increase the aesthetic appearance of staircases, thanks to the wide range of different profile types, colours, and finishes. The slip-resistant design and excellent visibility also means Schlüter®-TREP profiles improve safety whilst also offering DDA compliant solutions. For more information, contact pr@schluter.co.uk or Tel 01530 813396. Images courtesy of Marc Hilligenn.